Background – I discovered this watch at the Malaysian outlet of Red Army Watches, which newly opened in December last month at the Tropicana City shopping mall. It caught my attention with its unusual lineage. The Zeppelin brand is of German origin. 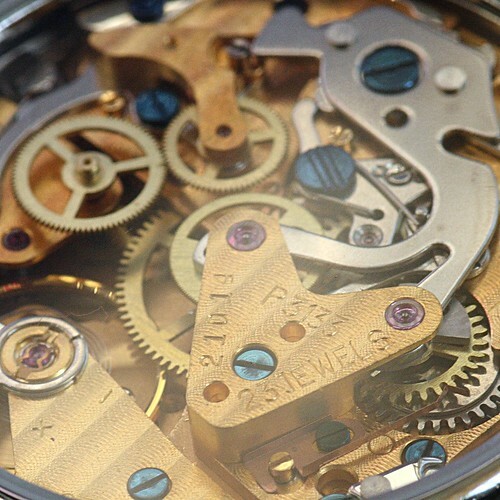 While the watch is labeled as “Made in Germany”, the P3133 movement is Russian made with a long history traceable to the venerable Swiss Valjoux 7734. This watch certainly piqued my curiosity concerning German made watches with Russian calibers. Movement – The P3133 is a manual wind chronograph movement which traces its roots back to the Swiss Valjoux 7734 manual wind caliber. 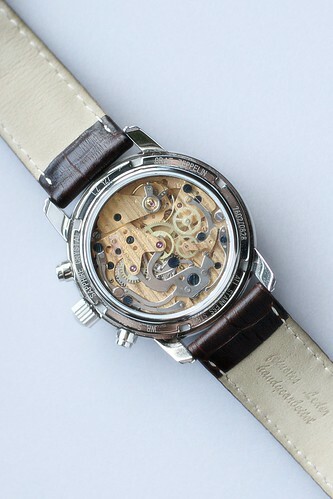 The Valjoux 7734 was part of the 773X family and is derived from the 7733 caliber with the addition of date function. The 773X family of calibers was introduced in 1969 when Valjoux decided to stop production, the tooling and design were sold to the Russian watch manufacturer Poljot (1st Moscow watch factory). 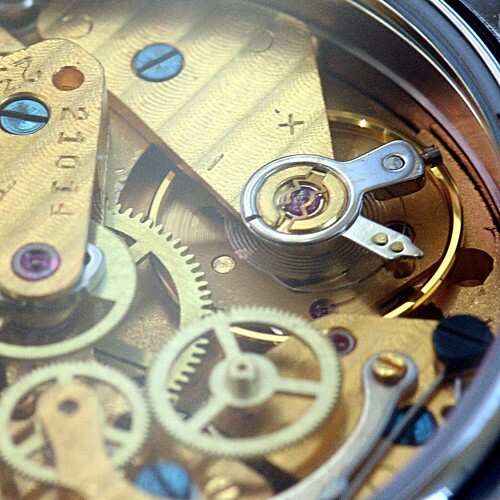 In Russian hands the Valjoux caliber was modified to become the P3133 movement. In 2005 another Russian company Maktime bought the production line for the P3133 movement from the 1st Moscow watch factory. The movement measures 31mm in diameter and is 7.35mm thick. It has 23 jewels and is shock resistant. The movement beats to the frequency of 21600bph. The plates are finished with a pattern reminiscent of the “geneva wave” and are gilded (gold plated). The screws are blued. The movement does not hack and does not come with quick set date function. Case – The case is 41mm in diameter and 13mm thick. Lug to lug the watch measures 49mm. It is made of stainless steel with a polished finish. The screwed-in case back comes with a display glass which gives a clear view of the P3133 movement. The watch is rated to 5ATM water resistance. Crystal – The watch is equipped with a scratch resistant sapphire crystal. The sapphire crystal is slightly domed but unfortunately is not AR coated. The glass on the display back is not sapphire. 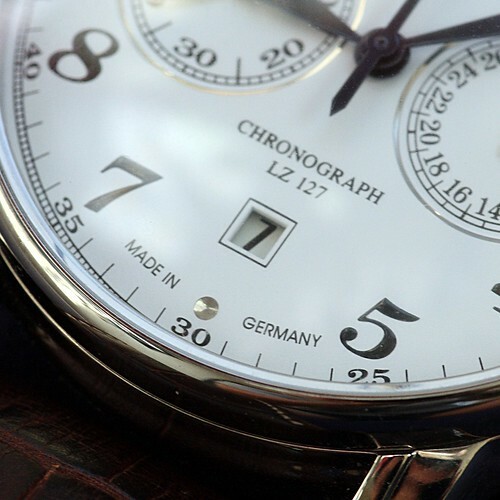 Crown – The crown is knurled which provides a nice grip, an important point for a hand wind time piece. Being a manual wind watch the crown and pushers are not screw-in type. 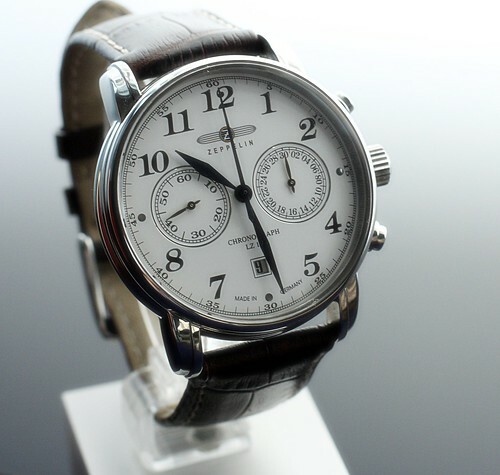 Dial – The large dial is white and legibly printed with arabic numeral hour markers (less the numbers 3, 6 and 9). There is an outer ring lined with the minute markers in 5 minute increments. There are 2 sub dials slightly sunken at the 3 o’clock and 9 o’clock positions. 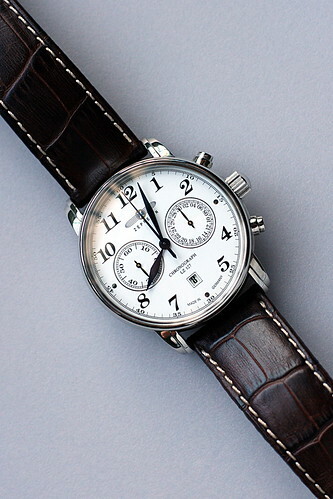 The left sub dial is the running seconds and the right sub dial is the 30 minute totaliser for the chronograph. A small date window is located at the 6 o’clock position. Below the date window is the finely printed “Made in Germany” label. The Zeppelin brand name is printed below the 12 o’clock marker. The hour markers are not coated with luminescent material which will be a point of concern if one needs to read the time in the dark. 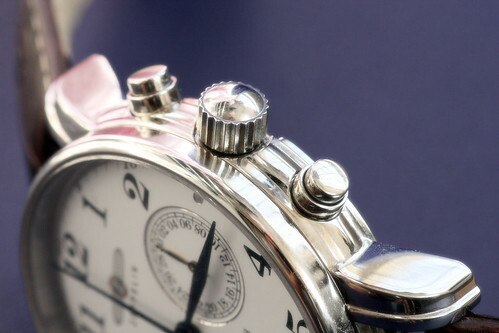 Hands – The hour and minute hands are sword shaped and nicely proportioned. The hour hand reaches to the arabic numeral hour markers and the minute hand is long enough to reach the outer minute markers. The hands are finished in dark blue and are not painted with any luminescent material. Strap / Buckle – The watch comes with a brown genuine leather strap with contrast stitching. The buckle is the tang type and is unsigned. Accuracy – The published accuracy of the P3133 caliber is -20s/+40s. However in my daily usage I find that the watch accuracy is not a point of concern. Power Reserve – The published power reserve of the P3133 is 42 hours without chronograph operation and 37 hours with the chronograph running. Comfort – For my 7 inch wrist the watch fits exceptionally well and is very comfortable to wear. 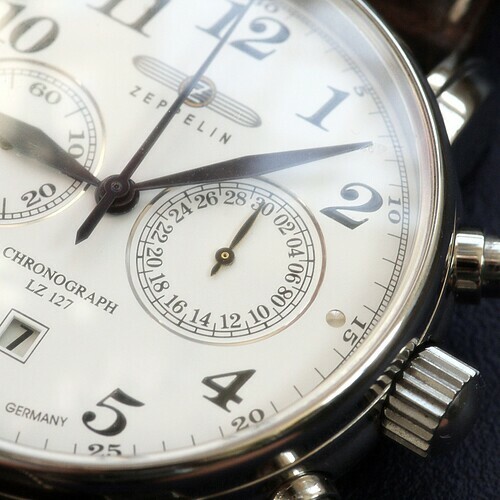 Overall Impression – The Zeppelin watch is well made as can be expected of a German product and the P3133 is a worthy caliber. 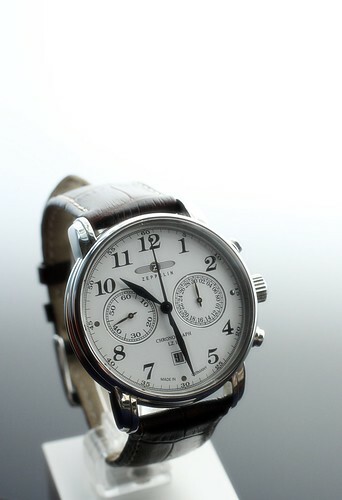 I must say that this watch, at a retail price of approximately 635USD, provides excellent value for money. 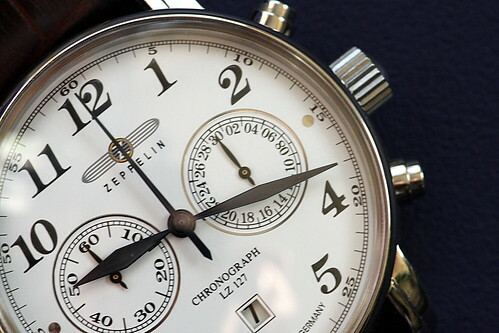 Any other Swiss made chronograph with equivalent hand wind caliber would easily cost multiples the asking price of the Zeppelin. “Made in Germany” – does it mean the same thing as “Swiss Made”. Not yet but hopefully someday it will. Display back showing the gilded plates and blued screws. Note the shock absorbers on the balance. Looks a lot like Incabloc type. “P3133” is clearly labeled on the movement. Hello, very nice description. It got my attention too. 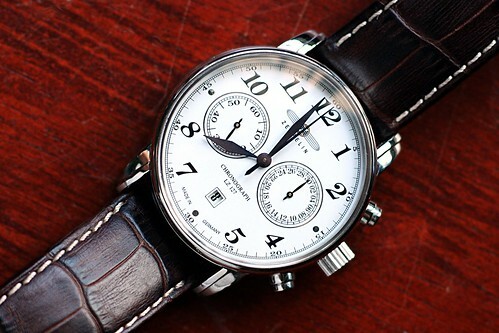 I am trying to find this watch for some time, but its either out of stock or its much more than 635USD as you mentioned here. Thanks in advance!